I sometimes talk about Kickstarter campaigns that have caught my eye, and seeing as how I love comics it makes sense those are generally what I focus on. 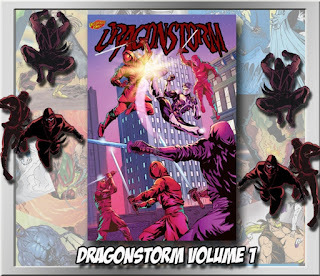 The creator of a new campaign named Jaydee Rosario reached-out to let me know he had just started a campaign to collect volume 1 of, "Dragonstorm." Jaydee actually first emailed me years ago back in 2012 when he was just starting, "Dragonstorm," and he has been working hard at the series since! "Dragonstorm," is the story of a hero who has to raise the granddaughter of his greatest enemy. Neither of them are excited about this but they need each other in order to survive. Jaydee is the writer and the great-looking art is done by Craig Shepard with Michael Summers on colors. I'm also encouraged by the fact that the entire story is done and they just are doing the Kickstarter to raise funds for printing the comic--this isn't one of those cases where you'll be waiting months-to-years for them to finish the book. It has 33 days to go and already has raised over 500 dollars of the $1549 goal. I wish Jaydee, Craig, and Michael the best of luck and hope their comic get funded! Check out the Kickstarter at this link!